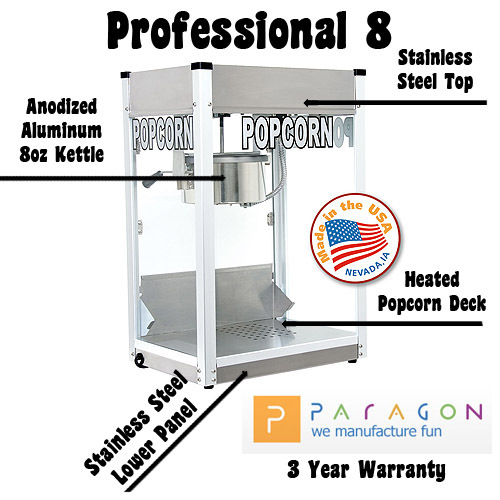 Paragon's Professional 8 popcorn machine features an anodized aluminum 8-oz. popcorn kettle. The popper chassis is decorated in stainless steel panels. Tempered glass sides, plexi-glass pair of doors, lower cal-rod heating element, old maid's tray for catching unpopped popcorn. 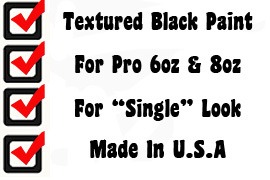 The Professional Series 8 oz popcorn machine is easy to fit into small areas due to its 20" wide by 14" deep footprint. This full-featured popcorn machine also includes a removable clean-out tray for easy cleaning and an old-maid drawer to catch the un-popped kernels. 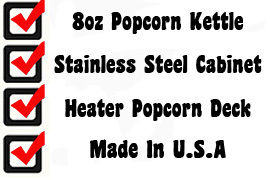 The Professional Series 8 oz popcorn machine utilizes a 50 watt R20 presentation lamp to highlight the popped corn for added impulse sales. This popcorn machine will cycle in approximately 3 minutes and produce 147 ounces of popped corn in an hour. One serving will produce enough popped popcorn to fill approximately eight 1-oz bags. Three-Year Manufacturer's Warranty. To see more pictures of the machine, click on the machine.